Red Wine, Green Tea and Dark Chocolate: Dinner Tonight! Grilled Artichokes..Let's Celebrate Spring! Dinner Tonight! 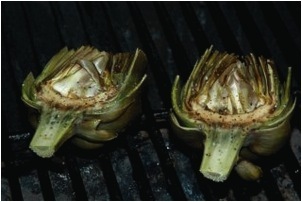 Grilled Artichokes..Let's Celebrate Spring! Clip the leaves of the artichokes to remove the thorn at the tips, and slice off the top ¾ of an inch. Bring a pot of generously salted water to a boil and add the artichokes. Boil for about 25 minutes, or until the outer leaves can be easily pulled off. Take out the artichokes, submerge in ice-cold water until cool, and then drain. Fire up the grill. I love charcoal for the distinct flavor. But a gas grill will deliver a fine feast of these beauties as well. While the grill is getting hot...cut the artichokes in half and pull out the thistle heart (purple and white leaves in the middle). Using a pastry brush, coat the artichokes with olive oil inside and out. Salt and pepper generously on both sides and place them cut side down on the cool side of a hot grill. The oil will cause a flare of flames if you put them over the fire so placement away from the flame is important. Remember artichokes are low in calories and healthy, healthy, healthy! They provide cynarin, which supports reduced cholesterol levels, and silymarin which supports a healthy liver. Add the lemon juice, egg yolk, garlic, mustard and red pepper flakes to the pitcher of a blender or food processor and put the top on. Turn on blender/food processor and remove the safety top. Slowly pour in about half of the olive oil until the mixture is emulsified. Turn off the blender and add a pinch or two of salt and one of pepper, or to taste. Restart the blender and add the remaining olive oil, or enough to make the sauce thick and creamy. Pour into dipping bowls.